During the past few weeks, I have been reading The Mark of the Plague by Kevin Sands. Upon research, I found that Mr. Sands wrote this book as a second edition to a series. The first book being ‘The Blackthorn Key’ – the name of the apothecary in the story. And the third book being ‘The Assassin’s Curse’. At the first look at the cover of ‘The Mark of the Plague’, the book gave the impression of being mysterious and sinister, with a snake coiled around the sword in a Latin emblem. Intrigued by the appearance, I immediately began to read. The book opens by introducing the characters of young Christopher and Tom; an apothecary’s apprentice and a Baker’s son. It also sets the scene of an Apothecary with an absent master - quickly mentioned to have been murdered by ‘The Cult of The Archangel’. However, for those readers that are unaware, it does not state what that is. This is the story of young Christopher Rowe; during the 17th Century plague epidemic. It tells about his journey, in which he discovers the secrets of the so called “Plague Prophet”, and thwarts him in his attempt to cause disaster in the vulnerable city. In my opinion, I believe that this book is witty, compelling, yet quite complex. The history in this book is accurate in mentioning the belief in which the Plague epidemic in London is caused by ‘Smells’. As the main character tests his own invention of the ‘Smoke Your Home’ - which corresponds to that belief. It also highlights how desperate the citizens of London are becoming at this time. This is also shown by the scornful manner in which the ‘Quacks’ (people who would sell false cures to make money) are portrayed. The author describes these crooks to be “Preying on the desperate”. Here, I think the author has included his own opinion. This, I personally believe, is a key element for writing a good story. The main character is orphan and apothecary apprentice, young Christopher Rowe. He is the most significant as he narrates the story, and describes his thoughts and feelings to the reader. I presume this is done to assist the reader in truly empathising with this character in his difficult situation. In my opinion, this is done exceedingly well because, as the story goes on, you begin to feel real empathy and a growing bond with this character. Christopher is considerate, insightful, courageous and innovative in his bold, witty actions and thoughts. As well as getting to know Christopher, you learn about the other characters and the relationship the main character has with them. As I pointed out previously, the author is quick to mention Christopher’s late master; Master Benedict. Although he is dead, the author makes it out as if he is there with his apprentice. Helping him along the way. Giving him advice and help. Throughout the story, Christopher describes the bond between himself and his master before his passing. Portraying him almost like a father figure. The character often- in his mind- asks his dead master for help when he is struggling. Master Benedict “answers” him with comments like: ‘Think, Christopher. You’ll know what to do’. At the end of the book, the author tells us that the historical language used in the story is sometimes modernised to be more legible to a 21st century reader. Some vocabulary in this book is from the past. Words such as “Breeches”, “Apothecary” and “throng” are frequently used. Would I recommend this book in future? The general answer is yes. But under certain circumstances. They would have to be quite a keen, resilient reader to be able to persevere and make sense of the book. In conclusion; The Mark of the Plague is a witty and intriguing book which is well worth a read! I enjoyed this book. I especially enjoyed the unsuspected plot changes at the end. I believe some aspects were historically accurate and realistic, like people pretending to have a cure, but children climbing buildings and blowing up houses were not. Yes, as it was different and interesting, I would want to read the other book and see if it was a sequel. During the past few weeks, I have been reading The Mark of the Plague by Kevin Sands. Upon research, I found that Mr. Sands had wrote this book as a second edition to a series. The first book being 'The Blackthorn Key' the name of the apothecary in the story. And the third book being 'The Assassin's Curse'. 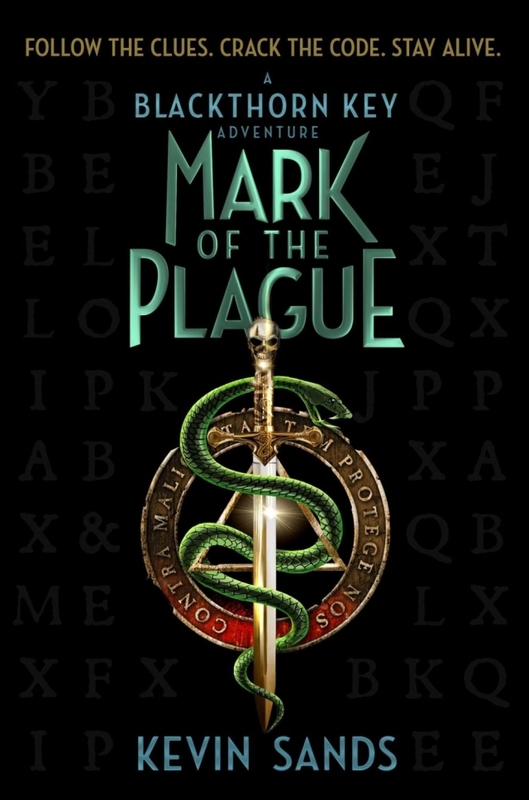 At the first look at the cover of 'The Mark of the Plague' the book gave the impression of being mysterious and sinister, with a snake coiled around the sword in a Latin emblem. Intrigued by the appearance, I immediately began to read. The book opens by introducing the characters of young Christopher and Tom; an apothecary's apprentice and a baker's son. It also sets the scene of an Apothecary with an absent master- quickly mentioned to have been murdered by 'The Cult of The Archangel' However, for those readers that are unaware, it does not state what that is. This is the story of young Christopher Rowe; during the 17th Century plague epidemic. It tells about his journey, in which he discovers the secrets of the so called 'Plague Prophet' and thwarts him in his attempt to cause disaster in the vulnerable city. In my opinion, I believe that this book is witty, compelling, yet quite complex. The history in this book is accurate in mentioning the belief in which the Plague epidemic in London is caused by 'smells'. As the main character tests his own invention of the 'Smoke your Home' which corresponds to that belief. It also highlights how desperate the citizens of London are becoming at this time. This is also shown by the scornful manner in which the 'Quacks' (people who would sell false cures to make money) are portrayed. The author describes these crooks to be 'preying on the desparate' Here, I think the author has included his own opinion. This, I personally believe, is a key element for writing a good story. As for the storyline; it is fairly complex and sometimes difficult to follow. In addition, you sometimes are unsure of what is happening in the story. I believe it is crucial for the reader to have a clear picture in their minds of what they are reading. Therefore, with a storyline of this complexity, more clarification would be necessary. However, the storyline is generally well-thought-out and very compelling. Including elements of quick wit, murder mystery and tragedy. It also impressive how the author makes you like a character, and trust them in such a way that you are as shocked as the main characters to discover that they are not what they may seem. Would I recommend this book in future? The general answer is yes. But under certain circumstances. They would have to be quite a keen, resilient reader to be able to persevere and make sense of the book. In conclusion; The Mark of the Plague is a witty and intriguing book which is well worth a read!